no option to "open link in new tab"
First of all, I just moved to opera yesterday after long years of chrome usage, so far I'm really loving it! however there's this small problem which I'd be helpful if someone tackled! I currently am experiencing somewhat annoying issue, I work with google forms day to day and I get really a lot of responses there and each of them consists of dozens of links, and the issue is, there's no option to "open link in new tab", if I open link it automatically just opens it in same tab, which means after I'm done checking provided link, I gotta manually go back, find my way back to whichever response it was out of dozens and continue it on like that, which is definitely adding a lot of unnecessary work. I hope I've explained this well enough, sorry for any grammar errors I've possibly made. It seems it's not detected as a Link or some text is selected too. You can try on a Private Window or with this. Opera is seeing it as just text, not a link. 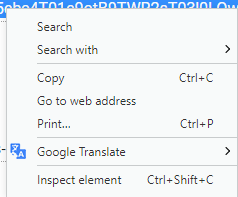 If you hold Ctrl while selecting "Go to web address" it should probably work. @zalex108 tried out that userscript, it doesn't really work unfortunately in google forms, the link remains unclickable. @sgunhouse holding ctrl works, thanks for that it'd still be nice to somehow have it seen as a link instead of text, although I'm not sure right now if it would be google forms fault or operas. I don't use GForms to test if something could be done. Didn't know about that trick.